You can call Christoph Kemper "The Profiler." Seriously, he won't mind! 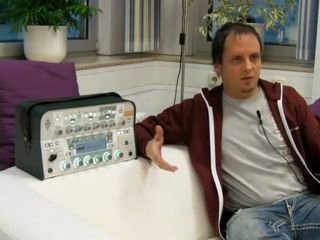 Last week, Kemper GmbH announced the new Kemper Profiling Amplifier, which will be unveiled at the NAMM 2011 show in Los Angeles. In the video above, Christoph Kemper himself explains what the company describes an "entirely new and groundbreaking concept for guitar amplification in the digital domain." The basic (and, apparently, "radical") idea behind the Kemper Profiling Amplifier, which Kemper discusses in the video, is that every guitar player should be able to bring his own signature sound of the tube amps he owns into a versatile, comfortable and reproducible format. To this end, the Kemper Profiling Amplifier takes the "sonic fingerprint" of virtually any amplifier - and even allows players to tweak stored sounds. MusicRadar will be at NAMM in just a couple of weeks, so we'll be sure to give you a full report on the Kemper Profiling Amplifier...and a whole lot more!